The Krakow Film Music Festival (FMF), organised by the Krakow Festival Office and RMF Classic, is a captivating showcase of the highest quality musical interpretations of the moving image and one of the most important festivals in the world of film music. Performed by leading musicians and orchestras in Europe and the world, the festival provides a unique concert experience by setting it to live screenings of the world’s most spectacular films, well-known for their dazzling cinematography, top-class direction, enthralling plots, and emotive acting. The Festival takes pride in its diversity of featured music and film, all-star roster and the diversity and size of its audience.The 2014 edition anticipates an audience 35,000 strong in total. From retrospective performances of the classics to exclusive ceremonies distinguishing contemporary favorites and celebrating international superstars of the industry, the event’s boldness in production, innovativeness in the sphere of sound and film technology, and outstanding talent is an annual showcase of the best in the film music industry. The Krakow Film Music Festival has become one of the most widely-recognized Polish cultural exports around the world that has delighted fans since its inception. FMF is an important industry event, the sight of international and Polish premieres, which often take place in the presence of world-class directors and composers. The Festival hosted, among others, Oscar winners: Elliot Goldenthal, Tan Dun, Howard Shore, Jan AP Kaczmarek; eminent composers: Joe Hisaishi, Shigeru Umebayashi, Don Davis, Alberto Iglesias, Trevor Morris, Michal Lorenc, Wojciech Kilar, Reinhold Heil, Johnny Klimek, Abel Korzeniowski, Eric Serra; film directors: Tom Tykwer, Julie Taymor, and Tomas Alfredson. In 2014, Elliot Goldenthal, Garry Schyman, Johan Söderqvist, Dario Marianelli, Patrick Doyle, Gustavo Santaloalla, and Hans Zimmer graced the Festival stage. 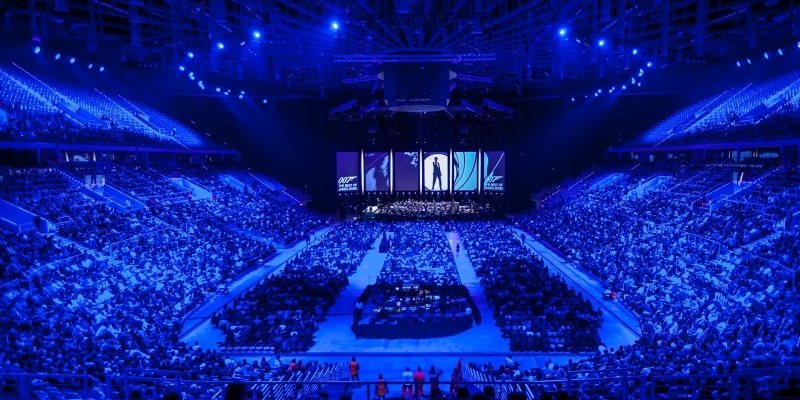 The festival is famous for its so-called simultaneous productions, Live in Concert, which feature large-scale film productions set to music performed live by the greatest orchestras, as well as its exclusive Film Music Gala that gathers high-profile personalities from the world of the big screen. Since the Krakow Film Music Festival also draws great interest among the film community and attracts to the capital of the Malopolska region the contemporary elite from the world of music, culture and film, as well as lovers of cinema and film art, it is important to treat the Festival as a large-format event that contributes to the promotion of the activities related to the Regional Fund Film, as well as the promotion of local infrastructure and music bands and orchestras of the international cinematographic market. The festival has become a natural place for cooperation between representatives of the wider film industry. The Audiovisual Forum serves as a professional educational platform for young composers who wish to build their career in the international film market. Under the supervision of renowned specialists and experts from Hollywood, young composers learn the secrets of the complete process of creating a soundtrack and explore key issues related to the functional specificity of music in relation to the principles of the audiovisual market and the global film industry. The Audiovisual Forum consists of the Master Classes, but also panel discussions and meetings with eminent composers. The festival organizes an international competition for young composers -- the Young Talent Award – as well as the privilege of performing the winning suites during the prestigious final gala. This is the only competition in the world where the winner has the chance to work alongside award-winning composers and showcase their work for an audience of thousands, alongside a full symphony orchestra. alterFMF presents not only the most important soundtracks of European, Asian and Hollywood cinema, but also explores the realm of music composed for video games, animation, and TV series, while observing a significant increase in the importance of the audiovisual sector, and also an important trend of alternative cinema and niche music that invokes various musical genres from jazz improvisation to hip-hop, ambient and world music to electronica. In order to include the youngest recipients of culture, FMF consistently develops a programme dedicated to children and youth. In cooperation with publishers, special arrangements of film music were prepared for a youth orchestra and in 2014 the FMF Youth Orchestra will take the stage for the first time and will consist of the most talented students from Krakow’s music schools, who will perform film music’s biggest hits. As part of FMF4kids, workshops for children, morning screenings and concerts set to cult-classic fairy tales will also be organized. From its very beginnings, FMF has emphasized social responsibility and environmental issues. It cooperates closely with leading charities, such as UNICEF and local hospices in Krakow, while also promoting the cultural participation of people with disabilities. Together with the 7th Sense Foundation FMF organizes audiodescription for the visually impaired and blind. FMF wishes to ensure that the Festival is accessible to all. Low ticket prices and programmes tailored to different interests and age groups are also meant to serve this goal. Thanks to cooperation with local schools, we communicate the need for a harmonious coexistence of man and nature and instill environmental awareness in children, while simultaneously encouraging action. The Festival is coordinated and organized by the Krakow Festival Office. FMF’s Artistic Director is Robert Piaskowski.